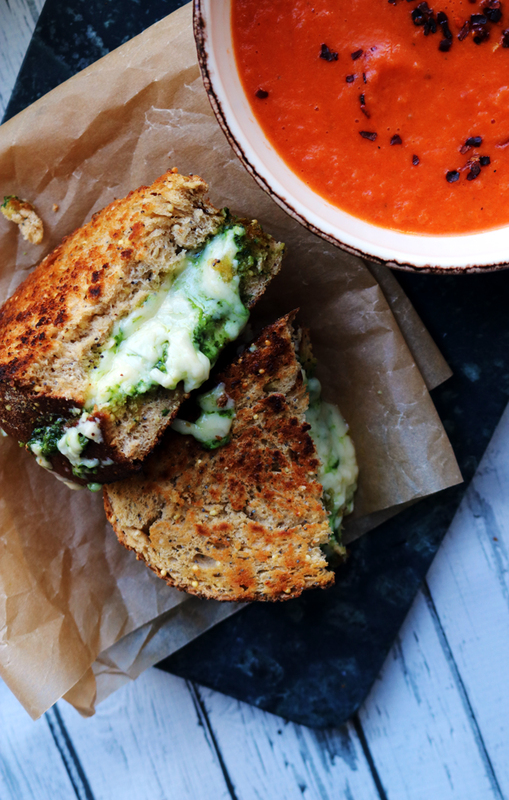 Grilled cheese sandwiches stuffed with homemade basil pesto and cheddar cheese are served with a creamy tomato soup in this comfort food classic. I realize the blizzard was two days ago, but today still feels like the calm before the storm. Because tomorrow at EXACTLY 12 NOON I find out where I matched for residency!!!!!! So, basically, the rest of my life in one envelope. THIS ISN’T EVEN A RECIPE. I mean, it’s grilled cheese. I’m pretty sure we could all make grilled cheese in our sleep. And pesto, but honestly I rarely even use a real recipe for pesto, I just throw everything in a food processor and hope for the best. 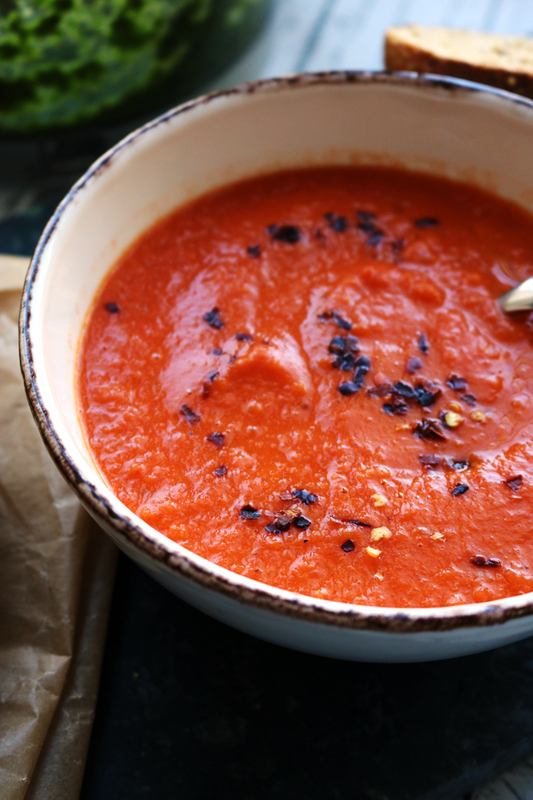 And tomato soup, well…okay, that’s a recipe. But it’s an easy one! If I can do it in this time of mental chaos, then you can do it when you probably have all of your faculties with you. And you SHOULD, especially if you have anything even remotely stressful going on in your life because GRILLED CHEESE AND TOMATO SOUP?! That’s like, the classic-est of all the comfort foods. 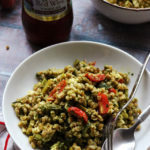 If comfort foods had a grandma, THIS WOULD BE IT. It’s creamy, it’s cheesy, and it’s just down right feel-good food. Completely necessary at times like these. Or at any time. Heat the butter and olive oil in a large heavy-bottomed pot over medium heat. Once the butter is melted, add the onion and garlic to the pan. Saute until the onion is tender and translucent, about 5 minutes. Add the tomatoes, water, cream, salt, red pepper flakes, oregano, and sugar. Bring to a boil and then lower the heat to simmer for 15 minutes. 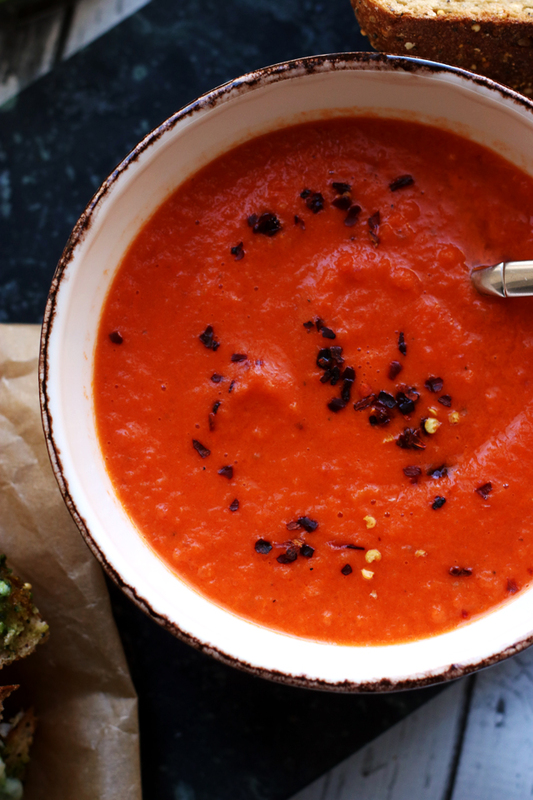 Remove the pot from the heat and puree with either an immersion blender or in the bowl of a tabletop blender. Season to taste with salt and black pepper. Serve warm. 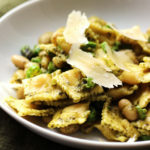 To make the pesto, combine the basil, pine nuts, garlic, and lemon juice together in the bowl of a food processor. Pulse until smooth. Slowly pour in the olive oil while the processor is still running. Add in the parmesan cheese and pulse again to combine. Season to taste with salt. Place the bread slices on a work surface. 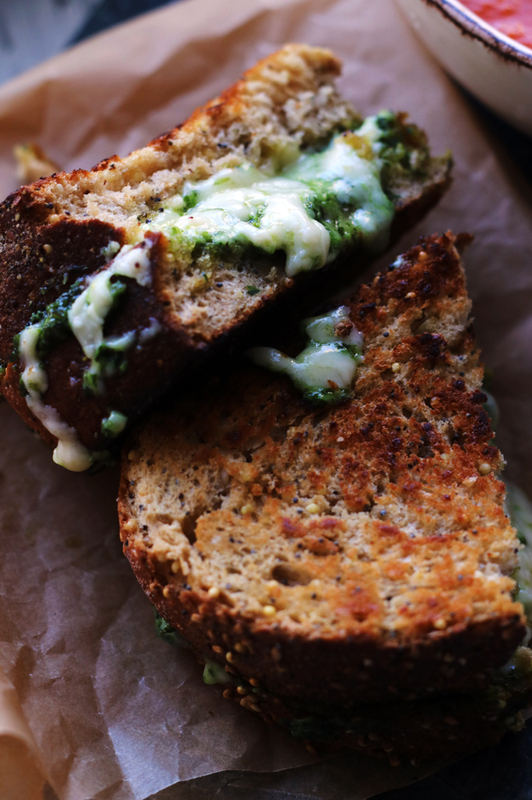 Spread the prepared pesto over the top of half of the slices. 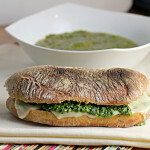 Divide the cheese among the pesto-topped slices and then top with the remaining 4 slices of bread. Heat a grill pan or skillet over medium heat. Grease with butter. Add the sandwiches to the skillet and cook until the bottom side is brown, about 3 minutes. Flip and brown the other side, another 3 minutes. 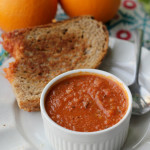 When both sides are brown and the cheese is melted, remove from the skillet and serve warm with the tomato soup. Good luck!! Meanwhile, I added this to my menu ASAP. How exciting, good luck! I’ll eat grilled cheese and tomato soup anytime as well 😉 Have a great weekend! I don’t think there is anything better than grilled cheese and tomato soup. You have taken a classic and definitely elevated it. Fabulous! It’s the “seeduction” bread from whole foods!